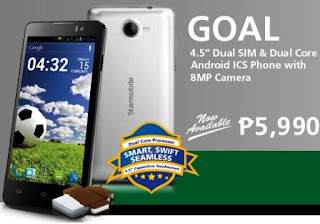 Starmobile Ice Cream Sandwich smartphone, the Starmobile Goal! Previously been kick to the market first in Lazada PH and now nationwide. Re-branded from i-mobile i-STYLE Q5 in Thailand, Starmobile Goal will surely hit the field with its fast 1GHz dual-core MediaTek MT6577 processor, loaded with 513MB of RAM Starmobile Goal will perform its exceptional sportsmanship in the smartphone industry. Crystal crisp display of 4.5-inch FWVGA with 854x480 resolution and 218ppi pixel density. Connectivity to team players will include WiFi, Bluetooth, and 3G with lighting speed of 7.2mbps down-link and 5.76mbps up-link. Plus capture meaningful events with its 720p HD video recording support, at the same time watch them without any lag, thanks to its PowerVR SGX531 GPU, take smartphone entertainment to its limits. For Php5,990 and available in 2 colors (Black and White) | Out now in the Philippines nationwide at Starmobile stores and online stores like Lazada PH. What can you say about Starmobile Goal? Is the specs worth the price? Kindly share your thoughts with us! Thanks.